Please note: Dual outlet exhaust products for 2013+ models will require the separate purchase of the OEM CC VR6 rear valance and heat shield. CC + AWE = OMG. Presenting the AWE Tuning CC 2.0T exhaust line up. Sound, power, quality and options. Featuring a straight through resonator combined with AWE Tuning 180 Technology™, our CC 2.0T Touring Edition Exhaust has a velvety smooth European tone that is civil under part throttle yet produces an aggressive note at full throttle – the best of both worlds. Including all hangers, clamps, bolts and paste to ensure a simple installation. Your choice of Chrome Silver or Diamond Black tips. This package includes the OE valance from the VR6 version of the CC, along with all modified and required heat shielding, clips and hardware. 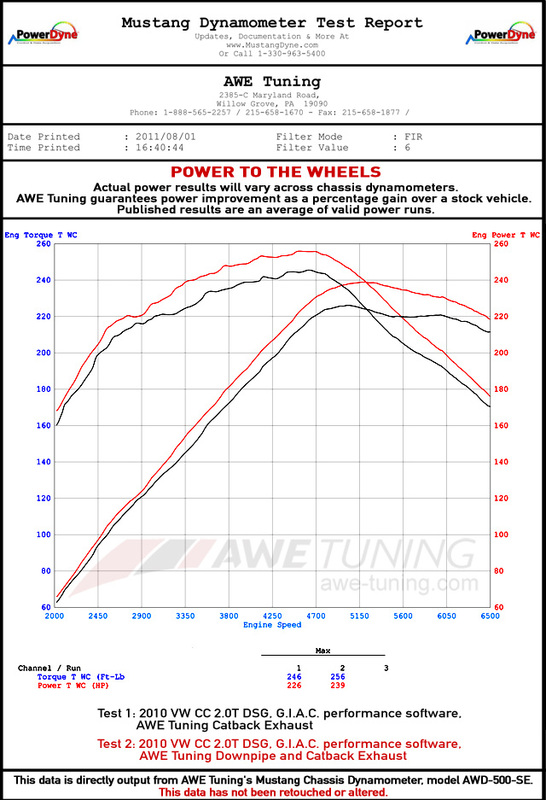 Below are comparison dyno tests as performed on our Mustang MD-500-SE AWD dyno. All tests were performed on the same car, CC 2.0T DSG with G.I.A.C. Stage 1 Software, with controlled ambient conditions. 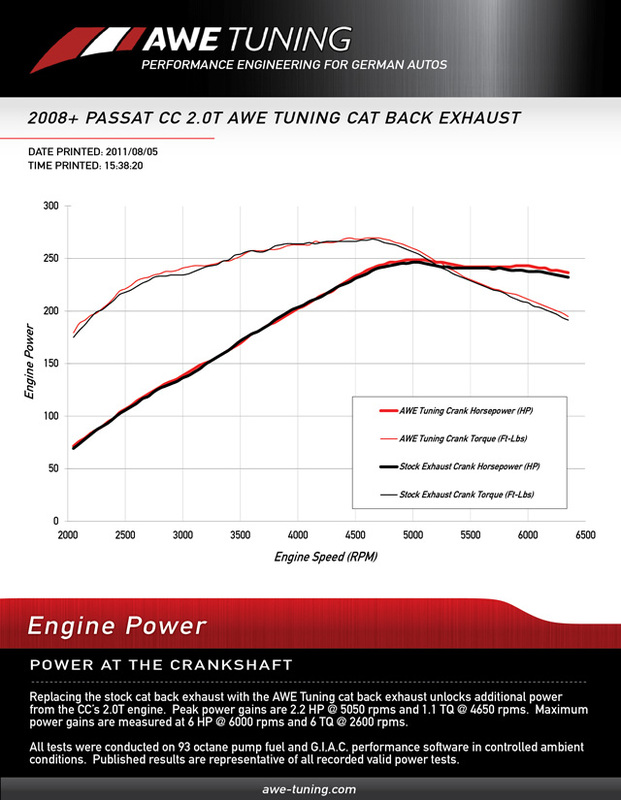 (Above) The addition of the AWE Tuning CC 2.0T Exhaust System results in a improvement in power. Gains at the power peaks were 2 wheel hp and 2 wheel torque. (Above) The addition of the AWE Tuning CC 2.0T Downpipe results in a solid improvement in power. Gains at the power peaks were 13 wheel hp and 10 wheel torque. This results in gains of 13.2 crank hp and 12.1 crank tq. (Above) The addition of the AWE Tuning CC 2.0T Touring Edition Exhaust and Downpipe results in a massive improvement in power. 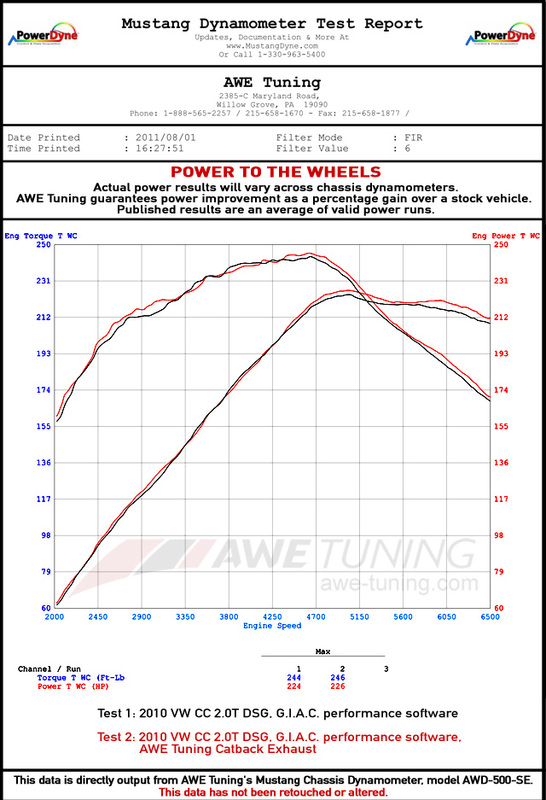 Gains at the power peaks were 15 wheel hp and 12 wheel torque. This results in gains of 15.4 crank hp and 13.2 crank tq. The AWE No CEL (Check Engine Light) Guarantee is noted on certain AWE products, and offers peace of mind against the appearance of Check Engine Lights when products are installed properly and used as intended, on vehicles with no additional modifications, with the exception of other AWE products intended to work with the product in question. One year from date of new product purchase (proof of purchase required). Repair, replace or consult toward resolution at AWE’s discretion. Customer is responsible for all shipping costs. If AWE deems the item to be defective and the item is either repaired or replaced by AWE, shipping within the US is covered by AWE. 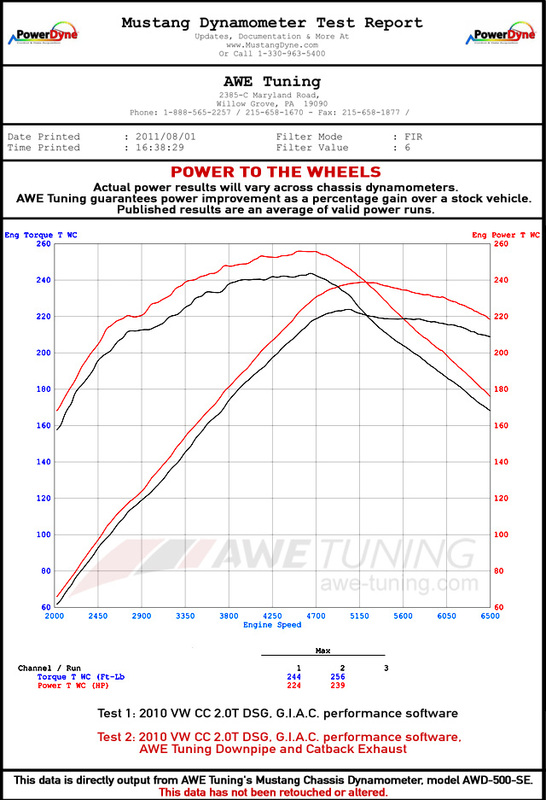 Only applicable to products where it is clearly stated as such on www.AWE-Tuning.com.